In today’s digital world, shoppers are treated to both tactile materials and interactive experiences. Why should workplace experiences be any different? Visitors to Instagram’s newly designed office in New York City are greeted in the lobby by a digital wall featuring rotating stories and posts from the app’s 800 million users, reflecting the pulse of the business. Within the workspace, visually innovative, photogenic spaces like The Dome, a prismatic glass dome, and the miNY conference room, a tiny mobile alcove for one-on-one meetings, bring the brand to life and allow both employees and visitors to meet, socialize, and take Instagram-worthy photos. Good workplace design makes digital displays more than just surface treatments; it involves an integration of both the architecture and physicality of a space, and the digital media content to create holistically designed experiences. 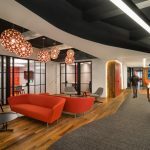 At Horizon Media’s New York City office, the neutral tones of polished concrete floors and steel columns are accented not only with brightly colored furnishings, but also vibrant digital features — including a fifty-foot-long display along the reception passage that reflects the company’s physical and digital activities while also tracking the stock market, internet traffic, and other metrics. Generative media also lends itself to presenting active narratives. In an elegant, high-tech makeover at 575 Fifth Ave in New York City, our design studio, ESI Design used Carrara marble wall treatments as a sleek backdrop to its centerpiece: a 192-square-foot band of media displays that wrap around walls and columns, presenting vignettes from around the city and echoing the rhythm of the street with data-driven content such as weather, trending headlines, information on local events, and financial reports. Here, the media displays become windows to the city outside. Reactive media can even use the densities and vicinities of people to generate different effects, presenting a building’s occupants with the narrative of their own interaction with the space. For Terrell Place in Washington, D.C., ESI Design created a 1,700-square-foot motion-activated mural in the lobby that comes to life as people pass by, displaying cherry trees that blossom and then lose their petals. When passersby pause in front of the display, they trigger a flutter of butterflies across the screens. Reactive media can also be used to build community and invite collaboration. In Google’s New York City offices, City Cave is an alcove where users gesture toward emotion-related search terms appearing on surrounding screens; the software then conjures related NYC imagery. It imbues the abstract concept of search algorithms with an immediacy that inspires employees across the company’s spectrum, from tech professionals to advertising executives. On eBay’s Silicon Valley campus, a vibrant 20,000-square-foot hub called Main Street also fosters social interactions and collaborations, transforming the eBay brand into a people-centric experience while underscoring the company’s theme of community. ESI Design, created large-scale, interactive experiences that bring the magnitude of eBay’s platform to life, while an enormous multi-screen LED display offers webcast and presentation capabilities for company-wide town hall meetings. Smaller spaces – from a coffee bar and an outside deck for meeting breaks to an exterior patio for lunches and informal meetings – offer opportunities for impromptu gatherings. These dynamic experiences not only invite employees and guests to engage with the company’s story and each other — they also transform the eBay workforce into a connected community and see how their work fits into the company’s larger mission and goals. By integrating work tools, digital media and displays can become fully functional. The leading furniture manufacturer Steelcase is working with Microsoft to create workspace designs for digital natives that will feature areas such as Idea Hubs, Makers Commons, and Duo Studios, which incorporate Microsoft technology to facilitate and encourage active participation among colleagues and allow remote teammates to share ideas. 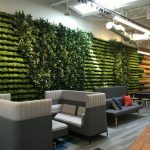 Digital designs can also offer employees an important connection to nature. Respondents to the 2015 Human Spaces Global Report who worked in environments with natural elements reported a 15 percent higher level of well-being, a six percent higher level of productivity, and a 15 percent higher level of creativity; a full one-third of respondents said the design of an office would affect their decision to work for a company. For a technology driven take on nature, ESI Design created an 8-story digital installation for the Wells Fargo Center in Denver, featuring floor-to-ceiling waterfalls, a grove of trees that sways in the breeze, sunrises and sunsets that appear at the right time of day, and a flock of nearly 4,000 birds that are animated in real-time using an algorithm that prevents flight patterns from repeating. Similarly, organic food brand Clif Bar & Company has a wall-projected slideshow of the great outdoors in its 300,000 square foot facility in Idaho. Technology’s capacity to create a more people-centric workspace will only continue to grow, and artificial intelligence looks to be the next frontier. San Diego’s Secure Smart Office is at work on an AI-controlled office environment that adapts to an individual’s needs and preferences, automatically adjusting everything from lighting and temperature to chair height and the photos on a desktop screens. When workspaces use technology to enhance the day-to-day experiences of their employees, those employees can become more productive and engaged. From massive installations to interactive tools, there are a number of ways to enhance effective and efficient workplaces that employees thrive in through smart design and technology. This article was published in collaboration with ESI Design. All images are courtesy of ESI Design.